Raw honey has long been known to be a powerful “superfood,” but some health experts believe that its health benefits cannot compare to the benefits of Manuka honey. Manuka honey is a special type of honey from New Zealand, produced with pollen from the Manuka bush. Manuka honey is purported to have certain natural components that can’t be found in other types of honey. Since ancient times, honey has been used for its healing properties. While regular raw honey does have many proven benefits, Manuka honey is alleged to have special qualities that make it more nutritious and healing. The most potent Manuka honeys have a higher Unique Manuka Factor (UMF), which is a rating system used to classify which are the healthiest Manuka honeys. High UMF Manuka honeys have a concentration of something called methylglyoxol. It is this natural ingredient that separates Manuka from other types of honey and gives the honey its potent health benefits. Methylglyoxol is antimicrobial, anti-inflammatory, and antibacterial. “Active Manuka Honey” has a UMF rating of 10 or over, which means that it has more of this beneficial, healthy ingredient. The higher the UMF rating, the better the Manuka honey. Manuka honey also has many other types of vitamins, minerals, and enzymes, which all work together to enhance its healing effects. Look at the following Manuka honey nutritional information chart, which shows why this honey is so nutritious. Manuka honey also comes loaded with antioxidants. There are not many calories in Manuka honey and there is no fat or cholesterol. Manuka honey has a good glycemic index (GI), which means that its sugar is absorbed slowly and digested more easily. It goes without saying that there are many Manuka honey health benefits. Given all of its potent ingredients and nutritional content, it is easy to see why there are many potential health benefits to eating Manuka honey. Still, you may be surprised at some of the benefits that can result from simply adding Manuka honey to your diet. 1) Diabetes: People with diabetes have to be very careful about what they eat and should always consult with their doctor first. However, the vitamins and minerals Manuka honey contains can possibly help balance blood sugar, and it has a low GI, which means that it won’t spike insulin levels in the same way that foods with sucrose (the most problematic sugar) will. Manuka honey, in moderation, can be a healthy choice for diabetes. Remember to seek advice from your physician first. 2) Digestive problems: Manuka honey has antibacterial properties, which means that it can help treat digestive symptoms due to bacterial infections or overgrowth. Harmful bacteria are a major cause of digestive problems. With small intestinal bacterial overgrowth, the small intestine has an overgrowth of bad bacteria that can cause constipation, diarrhea, and upset stomach. Manuka honey has been proven to kill off certain types of harmful bacteria. 3) Skin conditions: While digestive symptoms are often due to bacteria, many skin conditions are also either caused or worsened by bacteria and microbes. For instance, acne is caused by bacteria in skin pores. As well, some other skin conditions, like rosacea, have been theorized to be caused by bacteria in the digestive system. Either eating or applying Manuka honey can help cure skin conditions, particularly ones caused by bacteria or fungi. 4) Fatigue: Many people suffer from fatigue or low energy, which can have a big impact on their day-to-day lives. Often, this is due to nutritional deficiencies. Manuka honey is loaded with B complex vitamins and minerals that can provide a big boost of energy. Manuka honey can be used daily like a multivitamin for increased energy and reduced fatigue. 5) Poor sleep: Manuka honey can actually provide you with a more restful and deep sleep. Manuka honey causes your body to release melatonin, which is a hormone that is important for controlling sleep. Manuka honey also slowly releases its sugars, which can give your body the energy it needs during sleep to heal. 6) Staph and bacterial infections: Since Manuka honey has antibacterial properties; it can also help reduce the risk of methicillin-resistant staphylococcus aureus (MRSA) infections, which can be life-threatening in certain circumstances. These “staph” infections are resistant to many types of antibiotics, due to the overuse and over-prescription of antibiotics. Luckily, studies have found that Manuka honey can help combat these infections. Using Manuka honey on wounds, cuts, or sores can help prevent an MRSA infection from occurring. 7) Wounds and burns: Using Manuka honey on burns, cuts, and wounds doesn’t just reduce the risk of bacterial infection. In fact, it can help burns and wounds heal more quickly. Manuka honey has anti-inflammatory properties, which reduce inflammation and promote healing. Manuka honey can even be used for pain relief. 8) Allergies: There are some conditions that we can never cure, and allergies are often considered one of those. Surprisingly, Manuka honey can be effective for curing or reducing certain allergies, such as birch pollen allergies. It is not known exactly why Manuka honey would have this benefit, but at least one study has found that eating Manuka honey reduces allergic symptoms by a significant amount. 9) Irritable bowel syndrome: One of the major contributors to symptoms in IBS and other similar digestive diseases is inflammation of the intestine, stomach lining, and colon. Manuka honey has been found to actually reduce colonic inflammation, as well as protect against damage. This makes it a potent treatment for conditions like IBS, which have no effective cure. Eating Manuka honey can bring relief for these conditions. 10) Tooth decay: Manuka honey has even been found to be effective for treating gingivitis. It eliminates plaque, reduces bleeding from gingivitis, and even promotes faster healing of the teeth, due to the vitamins and minerals it contains. Regularly using Manuka honey can be an effective way to prevent gingivitis and poor oral health. Manuka honey is not only healthy, but it also tastes great. It’s not often that something very sweet and rich is also good for you! Try to incorporate two tablespoons of Manuka honey into your diet each day. You can have some first thing in the morning as well as before bed (if you need to improve your sleep). 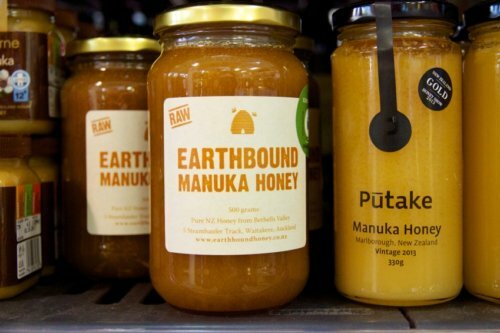 For some people, Manuka honey may be too sweet. In these cases, you can easily add the honey to a variety of different foods and meals. Mix it in with your tea or yogurt, add a little to your cereal or oatmeal, or spread some on toast. Manuka honey is a great flavor enhancer. When using Manuka honey for wounds, burns, or skin conditions, you can simply topically apply it to your skin, leaving it on for at least a few hours each time. Manuka honey is fairly thick, so it shouldn’t drip or run off once it is applied. Is Manuka Honey a Superfood? While honey has always been regarded as a healthy choice, some believe that Manuka honey has special properties that separate it from others. If you want to reduce inflammation or help treat a skin condition, or if you even just want to have an added boost of energy, look for “Active Manuka honey” with a UMF rating over 10. More research needs to be done concerning all of the benefits of Manuka honey, so the only way you will know if Manuka honey works for you is by trying it for yourself. You may be surprised at what a little bit of honey each day can do for you! “Honey Nutrition Facts,” Benefits of Honey web site; http://www.benefits-of-honey.com/honey-nutrition.html, last accessed December 11, 2015. “Manuka Honey,” WebMD web site; http://www.webmd.com/a-to-z-guides/manuka-honey-medicinal-uses, last accessed December 11, 2015. Rice, F., “Manuka Honey Benefits: What You Need To Know About This Wonder Food,” Marie Claire web site, July 13, 2015; http://www.marieclaire.co.uk/blogs/547196/manuka-honey-benefits.html. “Use of Manuka Honey by Diabetics,” Natural Matters web site, November 22, 2006; http://www.naturalmatters.net/article-view.asp?article=2738.